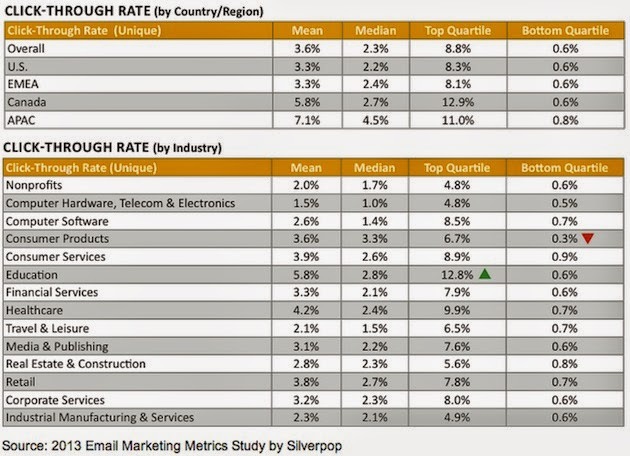 What is average e-mail click through rates? Unique open rate was defined in the report as the percentage of received messages that were opened by one recipient. Consumer products scored the highest open rate among industry verticals, tallying a median 25.4% unique open rate. While median open rates were fairly close across the board, top quartile performers achieved open rates more than four times higher than bottom quartile performers. Click Through Rate (CTR) By Industry in non profits business, computer hardware, telecom, & electronics, computer software, consumer products, consumer services and education supply. Why to start Email Marketing ? Because email marketing is still the most used and most direct channel for communications, and therefore having an email list is the best way to engage your readers and customers.